Whether it’s on paper or in person, seeing inside a house not one’s own has a special kind of appeal, especially for lovers of old houses. It’s a fun way to envision what it would be like to live in a historic house of your own, or, simply, just to appreciate the way old buildings continue to be loved. Here, we rounded up four of our favorite houses covered in Preservation magazine with extra photos for your own virtual historic homes tour. 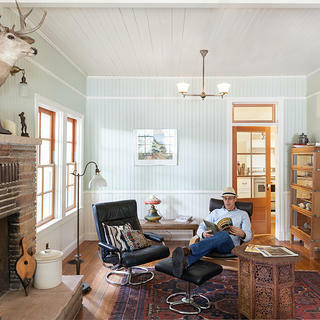 Starting off the tour is the first historic house we covered all the way back in the Winter 2017 issue of Preservation, a charming, robin’s egg blue cabin built around 1866 in the Sierra Nevada foothills. The Joseph McCullough Cabin presented some challenges to architect and owner Andy Carpentier, from malfunctioning plumbing to piles of 20th-century add-ons like vinyl asbestos tile. With a lot of dedicated enthusiasm and (rewarding) hard work, Carpentier transformed his home into a picture-perfect retreat with plenty of history still around. The Joseph McCullough Cabin was first constructed in the 1860s in the small town of Sonora, California. 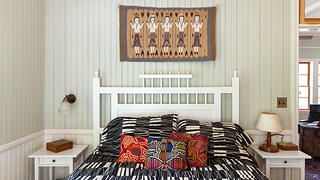 Boldly patterned furnishings contrast with beadboard and keep the cabin looking fresh. Andy Carpentier relaxes in one of the sunwashed rooms at his cabin. 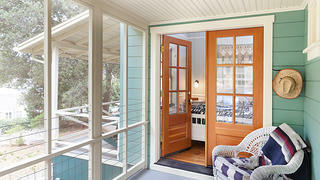 The screened-in porch at the Joseph McCullough Cabin offers splendid views of the Sonora hillsides. Traveling to the East Coast, let’s step inside the Isabelle Bowen Henderson House and Gardens, first seen in the Summer 2018 issue. 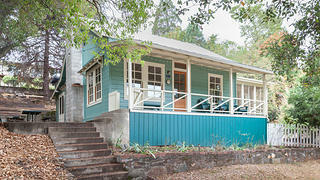 Located in Raleigh, North Carolina, the house is now owned by Bowen Henderson’s grandnephew. Having so much family heritage in one place to keep alive hasn’t intimidated Russ Stephenson. 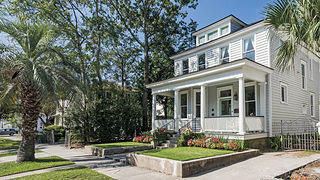 Not only did he work to get the house listed on the National Register of Historic Places, he’s made sure that his great-aunt’s legacy is seen everywhere you look, from the beautiful gardens she planted that surround the Victorian-era house, to a map of the Carolina Colonies she painted in the house’s front room. 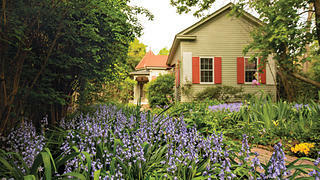 Perennials, including hyacinths and irises, fill the front garden. 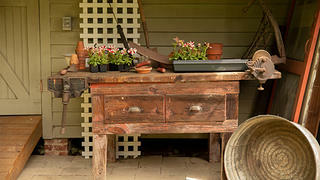 Isabelle Bowen Henderson's gardens need a lot of upkeep to make sure they keep blooming. 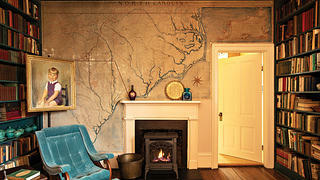 Bowen Henderson painted this 18th-century map of the Carolina Colonies in her house's front room. 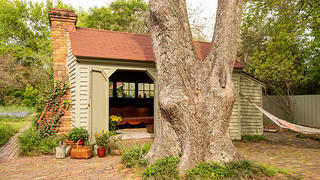 The garage, which was designed with big doors to look like a carriage house, is often rented out. Another house with family ties is the Kuhne-Drews House in Charleston, South Carolina. The circa-1915 house was built by the great-grandparents of English Kuhne Drews, who began a massive undertaking in 2015 to repair the house’s many problems. Even though Kuhne Drews was advised to tear the house down, she knew that the house, with all of its family history, was worth trying to save. She moved into the American Foursquare with her husband in 2016 and decorated the interior with family heirlooms that look right at home. The Kuhne-Drews House was built in 1915 in Charleston, South Carolina. The wrought-iron handrail was designed by the famous blacksmith Philip Simmons. The living room is furnished with family heirlooms, like the vase on the mantel. English Kuhne Drews and her husband, Stephen Giebner, relax on their back porch. 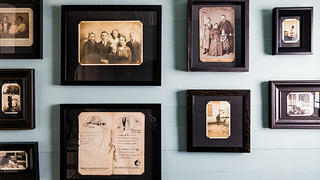 No family home is complete without historic family photographs. Kuhne Drews' father was a renowned camellia grower in Charleston, so Kuhne Drews honored his memory with this camellia-printed wallpaper. 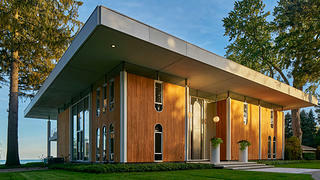 Sometimes, a house is just so extraordinary that it becomes a work of art. Anthony and JJ Curis understood this better than most when they purchased the W. Hawkins Ferry House in Grosse Point Shores, Michigan, in 2015. 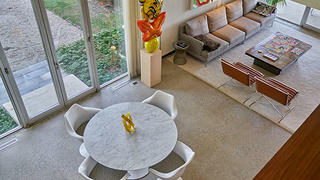 Built in the early 1960s for W. Hawkins Ferry, a philanthropist and art collector, he used the house to display pieces of his art collection that guests at one of his many parties would be sure to notice. Though it had been changed over the years, the Curises were able to piece together how the house looked originally, thanks to a box of old Polaroids, original plans, and a team of artisans who helped decipher the changes. Even though the house was built to be on display, the Curis family finds it a cozy and, well, homey spot to live. The back of the W. Hawkins Ferry House is just as impressive as the front, which faces Lake St. Clair. 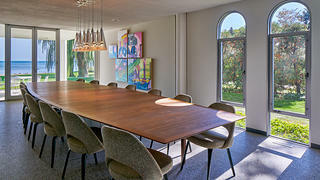 The sleek dining room table doesn't detract from the views of the lake on a sunny day. 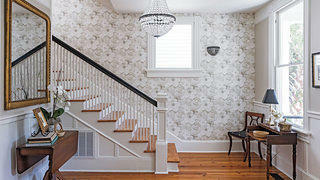 One of the many eye-catching details in the W. Hawkins Ferry House is the central spiral staircase. 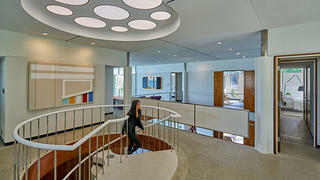 The different spaces blend seamlessly together to create a comfortable atmosphere.